Since I had the pliers out yesterday I finally got round to adding a clasp to a Sabine Lippert piece I finished beading a while back. 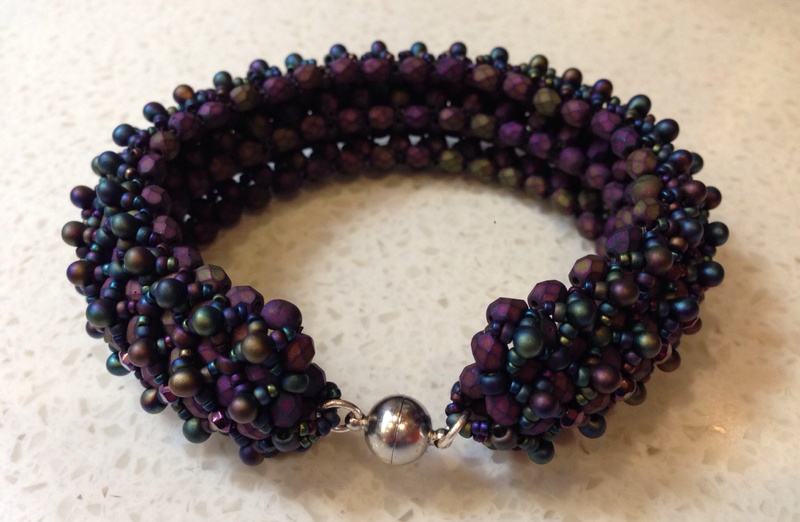 It’s a Baroque Dimensional Bracelet and instructions are available for download from her website, and the simplicity and repetition made it a really lovely piece to make – but of course as with all Sabine’s pieces it looks absolutely amazing. It curves beautifully – both around the wrist and across the width of the piece, making it seem lovely and fat and chunky. Very pleased with this one. Silver magnetic clasp, jump rings. The Miyuki Black Matte AB are a current favourite as they are a kind of navy blue base, and I’ve not been able to find another good match for navy. For some reason I am wearing a lot of navy at the moment and it is certainly easier to work with than straight black. I did 30 repeats as per the instructions, and it fits very nicely. The finished beadwork measures 20cm (without the clasps) although do bear in mind I am quite a tense beader. On that note, relax, relax, relax your tension, particularly for the base layer. For me that means beading in a way which felt baggy, floppy and downright messy, but you need plenty of give in order to add the embellishing layers. This is common with embellished RAW pieces. Otherwise as usual Sabine tells you everything you need to know……..
Another good relaxing project, like the Faux Cro, I’m definitely going to make another one of these when I have assembled enough Fire Polished beads (it does use quite a lot). Perhaps this time I’ll go a bit wilder with the colours (I’m thinking some sort of outrageous red, pink and orange with lime highlights again). Or perhaps something bright but wearable instead. 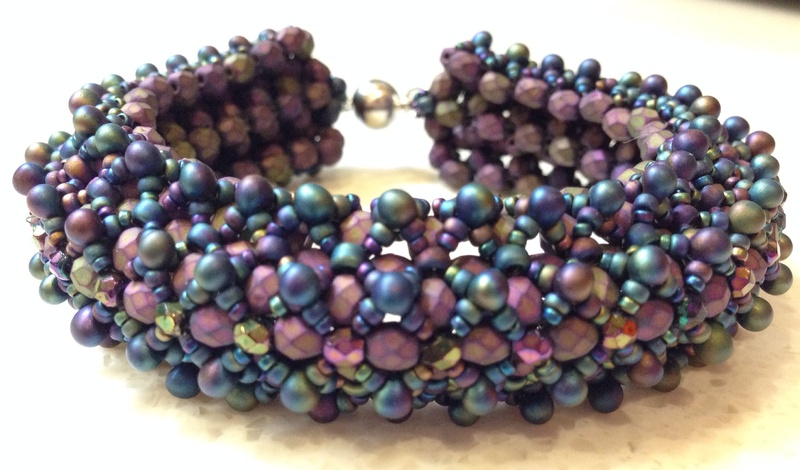 And I’ve got the pattern for Sabine’s Tweed bracelet to do as well yummy yummy. Sabine has also put together some beautiful kits, and one day I will definitely treat myself……..
A quick comment about ordering from abroad before I get told off for listing MoreBeads4U: I usually try to stick with local suppliers – although sadly I don’t have any ‘normal’ bead shops selling teeny beads locally, I use UK mail order shops where possible (mainly Stitch N Craft and Robins Beads). However wonderful they are though, it isn’t possible for them to stock absolutely everything I need, and I have now found (through Etsy) a super supplier in Latvia for Czech beads (links above) – reasonable and prompt postage, and pretty much every colour and size of fire-polished beads I could want, competitively priced. So while I continue to use and support my lovely UK suppliers when they sell the colours and shapes I need, and will always look here first, I do sometimes have to go elsewhere. 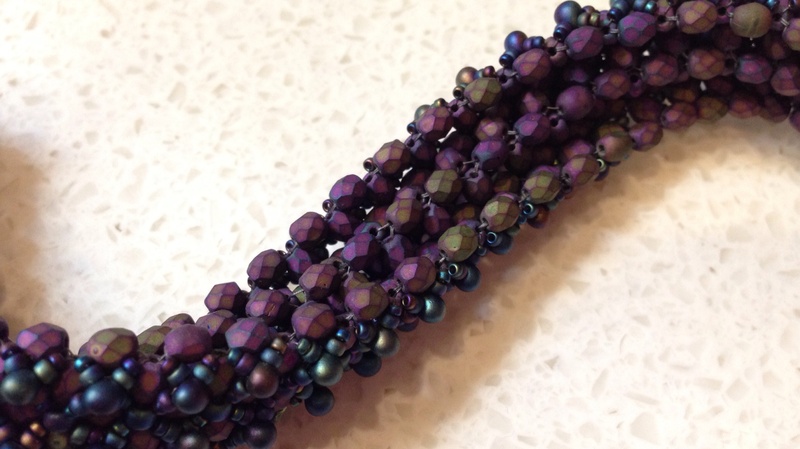 I don’t take this lightly, as shops like Stitch N Craft are so wonderful for the beading community – their class programme is probably the best in the world, they are very supportive of the Beadworkers Guild and bead groups and their range is absolutely wonderful. So their website will always be the first one I go to so that I can support them in return. Of course one day I will open my own bead shop, sell everything I want and consequently go bankrupt in a year. But it will be fun.